Fish in a Tree is realistic story about Ally Nickerson. Ally is a sixth grader who struggles with reading and acts out at school in an attempt to distract others from her difficulties. The problem is that she has begun to believe that the cruel names that some of her classmates have taken to calling her are true. Fortunately for her, things begin to change when she gets a new teacher, Mr. Daniels. He takes the time to look beyond her disruptive behavior, see her unique gifts and talents, and helps her learn to read well. I enjoyed watching Ally’s character develop over the course of the book. She overcame the labels that others had placed on her and looked beyond some of the labels that she had placed on others to find new friends. The end of the book hit just the right notes and was very satisfying! Book Reviews at Common Sense Media. 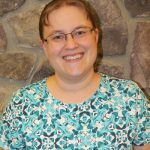 Hello, I'm Leah Baumgartner and I'm the Head of Teen Services at Wells County Public Library. My job includes planning and running programs for the teens, maintaining the Teen Zone collection of books, audiobooks, magazines, and games, and helping answer questions at the service desk. I love reading, spending time with my family, and going to living history museums.